Seven personalised embroidered mens everday use cotton handkerchiefs. Seven personalised embroidered mens everday use cotton handkerchiefs. Every man should have a cotton handkerchief in his pocket with his own initials or name embroidered on. 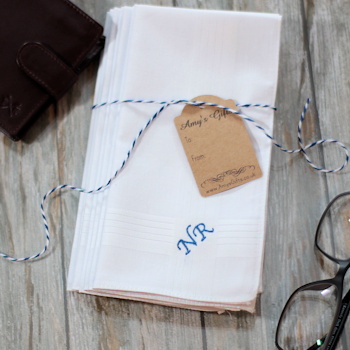 With this set you will receive 7 standard classic white 100% cotton mens handkerchiefs you can choose to have them personalised with initials or a name. Seven personalised embroidered mens everday use cotton handkerchiefs. Every man should have a cotton handkerchief in his pocket with his own initials or name embroidered on. With this set you will receive 7 standard classic white 100% cotton mens handkerchiefs you can choose to have them personalised with initials or a name. Just fill in the option box and choose the colour of embroidery thread you would like us to use for the embroidered initials or name. These come simply bundle tied with a ribbon around or you can add the option for them to be in a presentation gift box.